Happy Monday, everyone! So while I was in Asia, I promised myself not to lay my hands on anything black...and guess what? That did not happen. As I unpacked my lugguage and sorted through my pile of mess, I realized my collection of black clothing literally owned half of my entire suitcase. Nonetheless, black is still the safest color to wear, so nope. No regrets. For this outfit, the focus of this look is mainly the accessories. Oh, and of course the casual, loose, and comfortable fit of the clothing. As a teenager, I've often despised and avoided wearing curve hugging, low cut, attention drawing attire. If that was the way to seek love, and the definition of how a woman should be treating her body- I just could not agree. So growing up, that lead to my liking of the unisex style, especially that of Alexander Wang's designs. Therefore, I guess it's safe to say this outfit was heavily inpired by him and a bit of my personality. Ok, enough of my life story. So ya, mix in a bit of the punk/rock style with the studs, and buckles, and...voila! Out comes Carmen's choice of ensemble. Conservative, casual, comfortable, and chic. How else can I describe it? Oh and by the way, one store I recommend going to in Hong Kong would be a store called Maple. They sell trendy clothing at a super affordable price with decent quality. You can literally purchase a pair of stylish pants (like the one I'm wearing) for $8.00 Cdn. They also have quite a few branches of stores, so you really can't miss it! Another store I'd suggest in Asia would be b+ab. It's a fashion brand from Hong Kong (and my ultimate favourite store), so let's just say that I pretty much spent most of my spare time just browsin' through the boutiques while I was in Asia. It features Hong Kong's celebrity model Angelababy's choice of style and collection, so it's for sure worth checking out. Here's a short video of her modeling the 2013 collection. The brand is definitely not as cheap, but I'd say it's more afforable in Hong Kong than anywhere else. The only place online so far I found that carries their collection would be at ASOS. Otherwise, tough luck in trying to get the brand outside of Asia. I'll be featuring some clothing from b+ab, so be sure to keep an eye out! Oh how I wish they'd carry it in North America. Ok, I'm done blabbering for now. Wow, I've never put up so many links in one post. Until next time! PS: I promise there will be more colorful posts next time. PPS: A reminder to not take life for granted! Always cherish and love what you are already blessed with, for it is a gift from above. 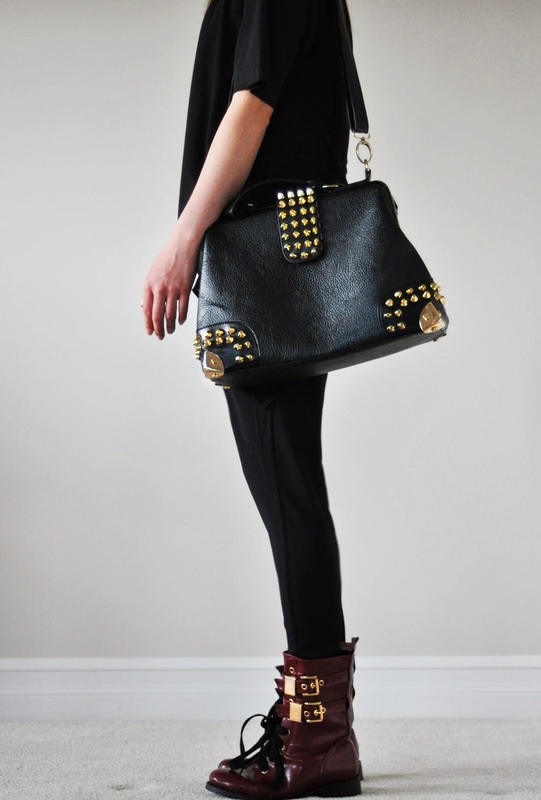 Studded Doctor Handbag: Purchased in Hong Kong for $30 Cdn, but you can also find it here. Woah. That is an amazing outfit. You look perf. I always wanted to go to Hong Kong and Korea especially for the shopping but I always chicken out and don't go during a summer so it's never happened. I can see it's worth the trip from your post though!! !